Released on May 4, Tour Guide is a gorgeous ode to motherhood with all of its ups and downs. Written and performed by Cheri Magill, the 30 minutes of music on this album capture those moments that drive a mom crazy like the Legos you step on everytime you turn around and the TV shows you have to watch that can only appeal to the under six set, as well as the joys of being a parent like the cuddles in the morning and the strength that a child instills in a mother. The theme of unconditional love flows throughout the collection, tying everything together. Rich musical arrangements support Magill’s lovely solo voice which is often reminiscent of Sara Bareilles. Her lyrics paint beautiful vignettes from the daily lives of a mother and a child and will touch the hearts of everyone who listens. 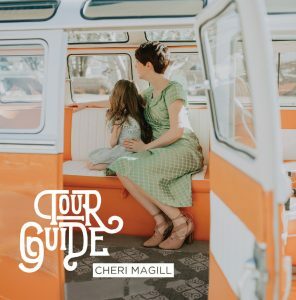 While mothers are the target audience for Tour Guide, anyone who has ever acted in the role of a parent will find a deep connection to the songs on this album. Just lovely. Take a listen to the title track, “Tour Guide,” below.